Live smart, hack life and level up your life with Fat Pipe ADSL! ** This cost-effective internet solution (Vox offers the cheapest rates in South Africa where you get 100GB for just R79pm*) allows you to maximise your DSL experience on a range of line speeds. Wide range of Top Up bundles available. Unused data that rolls over, and never expires. Free data from midnight to 06:00 every day. Free data won’t be deducted from the data bundle, or from rolled over data. ** This product is subject to the availability of a Telkom landline. No matter what your data requirement, from entry level to high-end, Fat Pipe has the bundle size to suit your needs, ranging from 100GB to a whopping 1TB per month. 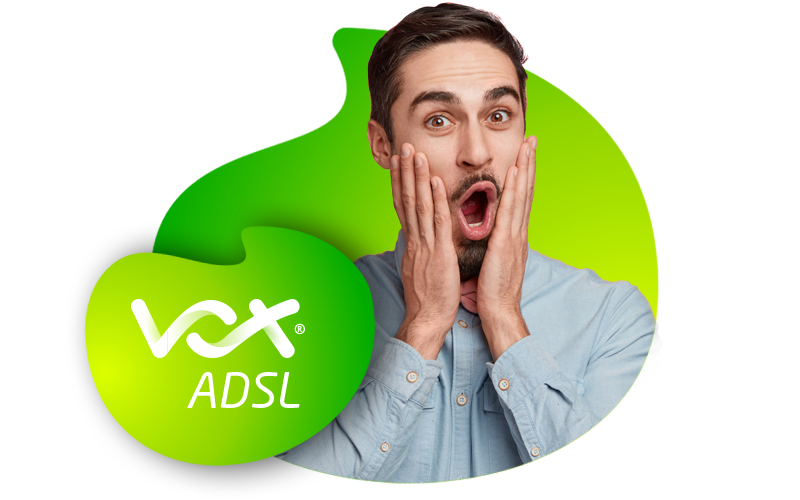 Using the Vox customer zone, you are able to monitor your ADSL data usage online, upgrade your ADSL subscription, or purchase top-ups when you need them. From midnight to 6 a.m. every day we give you free, uncapped surfing. The data used during this window is not deducted from your data cap at all. Yes. The ADSL service requires that you already have, or install, a phone (analogue/copper) line. Once the phone line is installed, Vox activates the separate ADSL service on this phone line at an additional cost per month. Can I use my Fat Pipe data on any ADSL line speed? Yes. Fat Pipe data is not affected by your line speed at all. Does the midnight to 6 a.m. uncapped use affect my Fat Pipe data cap? No. Free uncapped surfing is just that – FREE! It does not get subtracted from your Fat Pipe data cap at all. Is there a limit to the amount of unused Fat Pipe data I can accumulate? Yes. The maximum limit of unused (roll over) data is equal to six times your current monthly cap. What does this roll-over limit really mean? Assuming you didn’t use a single megabyte of data, for six consecutive months, all the data for those six months would accumulate and be available to you to use. May I subscriber to a Fat Pipe product if my ADSL service is from another ISP? Yes. As long as you are subscribed to an ADSL service, the data account may be provided by another internet service provider (ISP).